When desktop 3D printer manufacturers came onto the scene in the late 2000's, they generated a fantastical hype in the media apparatus that conflated the affordability and accessibility of desktop 3D printing with the capabilities of industrial additive manufacturing technology. This, plus the visions of dreamers, researchers and scammers in the 3D printing space, made the world temporarily enamored with the technology. It’s safe to say that in 2014, the consumer 3D printing bubble began to deflate. Stocks for companies like Stratasys and 3D Systems that were priced well beyond their worth began to tumble. Kickstarter scams were as common as Kickstarter successes. And desktop 3D printer companies that had helped launch the technology to fame were starting to go out of business. Primarily directed at consumers were 3D printing marketplaces, like Shapeways, Sculpteo, i.materialise and 3D Hubs, which promised the production of personalized products 3Dprinted on demand and shipped to a customer’s door. While the bubble may have burst, these companies are still operating in the market. How did they manage to survive the consumer hype? And will consumer 3D printing ever be a thing? We turned to each of the aforementioned companies to learn how they’ve adapted to the market and what they believe the future holds for 3D printing marketplaces. Davide Sher, CEO and founder of 3D Printing Business Media and senior analyst at SmarTech Markets Publishing, pointed out that, of the 3D printing marketplaces, Materialise is unique in that it has been in the industry the longest, both as a software developer and a parts manufacturer. Therefore, it may have been the most primed to shift its i.materialise marketplace toward more industrial applications. “For Materialise and i.materialise, it was just a matter of refocusing more on the core business clients,” Sher said. However, Miranda Bastijns, director for i.materialise, said that the company hasn’t changed its approach. “We haven’t fundamentally changed our strategy. By providing a consistent and reliable service offering, we’ve been able to maintain our business model,” Bastijns said. Bastijns also said that it’s not really possible to ascertain what the most printed category is in i.materialise. Therefore, it’s difficult to determine if the customer base has shifted. If that’s the case, Shapeways did not admit to any major effects from the consumer hype bubble. Greg Kress, newly appointed CEO of Shapeways, associated the bubble with desktop 3D printers, more than consumer-oriented 3D printing as a whole. Shapeways also offers manufacturing services, printing parts for clients such as Disney, Target and Google. Shapeways recently announced $30 million in new funding and, along with that financing, the company appears to be strengthening its focus on the consumer market. 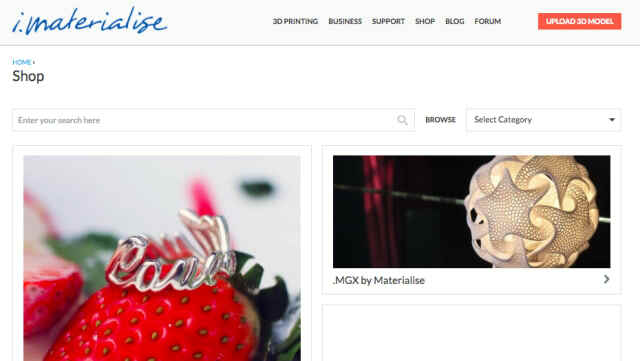 Though Bastijns from Materialise argues that there’s no killer app that can replace quality CAD skills at the moment, Shapeways seems to believe that its “Design with Shapeways” program can help facilitate the creation of goods, regardless of design experience and background. Shapeways also plans to offer marketing and business tools for store owners. Given the company’s focus on consumer goods, the products produced with Shapeways seem to be consumer oriented. “Our community has been printing everything from jewelry to tabletop gaming, prosthetics to eggs shells for wildlife conservation, prototyping to alter-ready wedding rings,” Kress said. Unlike the head of Shapeways, Clément Moreau, CEO and cofounder of Sculpteo, did admit that the market wasn’t ready for consumer 3D printing, as much as it was for business applications. Sculpteo has expanded beyond 3D printing to offer laser cutting, as well. Moreau said that, because the company had already established quality operations and “providing a professional result to our existing customers,” it simply needed to rebrand its image to be “more compatible with businesses.” Sculpteo also had to diversify its material options in order to deliver some that had specific mechanical properties for professional customers. Sculpteo offers a number of industrial 3D printing processes and serves clients such as eBay, Autodesk and MIT. In addition to shifting its focus more toward business applications, Moreau highlighted the power of 3D printing as one of the main reasons the company was able to weather the storm of the consumer hype bubble. Though 3D Hubs is not an online market where users can shop for 3D-printed designs, it is a service bureau. As a distributed network of 3D printing services, 3D Hubs couldn’t necessarily take the same approach as some of the other service bureaus in the space. When it began, the company relied on a number of desktop 3D printer users. In addition to other fabrication services, like CNC and injection molding, 3D Hubs has networked with companies that use industrial 3D printing technology. It also attempted to take on some of the features of manufacturing service providers. Among the features that 3D Hubs added to tailor the technology to businesses and engineers is automated design for manufacturing analysis, in which files are automatically checked for potential manufacturing issues and the proper manufacturing technology is suggested. There’s also a “smart sourcing engine” that sees a submitted order presented to the best matching suppliers based on capabilities and location. The first matched supplier to accept the price and lead time fulfills the order. “This competitive sourcing process leads to the best price in the market whilst giving the fastest turnaround times as the order is accepted by suppliers with instant capacity,” Fisher-Wilson said. 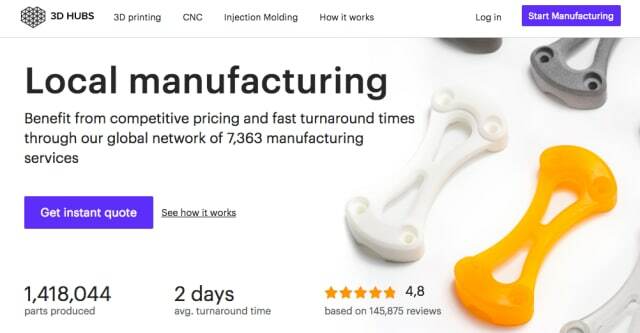 3D Hubs also boasts a pricing algorithm that relies on “dozens of parameters” collected from over 1 million parts to allow instant part production pricing. “We use a deep neural network to which is continually learn the best way to price parts for different manufacturing technologies,” Fisher-Wilson explained. 3D Hubs’ shift to B2B has resulted in having customers who are typically mechanical engineers and purchase managers, with prototypes, machine parts and electrical enclosures fabricated on the 3D Hubs network. The industries most served by the network are sensors and instruments, aerospace and healthcare. Now that most of the firms have redirected their focus toward business and industrial applications and technologies, will there ever be a consumer 3D printing marketplace the way many of them believed and some still believe is possible? Bastijns, from Materialise, also doesn’t anticipate consumer 3D printing to take off in the near future the way the media once projected. This is due, in part, to the skill required to design 3D models. Shapeways CEO Greg Kress is betting on consumer 3D printing in the short term. His predictions for the future of consumer 3D printing reflected his initial views regarding desktop 3D printing, as well. “I think that 3D printing in the consumer market will become prominent but in a different way than was initially expected. Instead of every American having a desktop printer in their home, we believe that on-demand 3D printing will become the norm for mass personalized goods like jewelry, home accessories, fashion and beyond,” he said. It’s clear from Shapeways that not all of the companies are targeting primarily business customers. However, most believe that consumer 3D printing marketplaces will take off, if not in the short term, then in the future at some point.